When I was going to UK and London again, I decided to do some search about London's beton brutalism buildings. I found this article: http://londonist.com/2012/05/londons-top-brutalist-buildings. This became my roadmap this time and I went to see some of those buildings, as much as I could. Also, it turned out that I was there in the middle of Brexit voting! I didn't know that anything like that takes place. Somehow I knew that there is something political going on but that's it. I went there on these dates because 23-26 were free days, 4 of them (as it sometimes happens)! After I came back, I saw from my credit card bill how the rate of GBP/EUR changed during one day, roughly from 0.8 to 0.85. Also, I wanted to know more what is going on and I bought a newspaper. It was a pro-EU paper and it had an index (!) on the first page about the probability of leaving EU: by memory, it was something like 0.26 only. I realised that this really took place on my last day there and I bought another newspaper from the Airport which was anti-EU and was, by their own words, an important part for this successful campaign for the past few years or so. That is, I have both views presented in two local newspapers too. My first selection was the Alexandra Road Estate (located in London Borough of Camden) because that was the most impressive one and also the farthest one from the centre. This booklet has more information: http://www.rowleyway.org.uk/images/obtq_booklet.pdf, there's also a documentary made by locals: http://www.rowleyway.org.uk/part2.html. As visible from the opening picture, there was a good view from under the Loudoun road bridge but my research wasn't that comprehensive so I didn't go there. 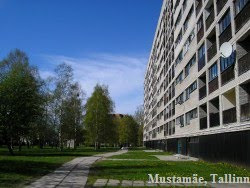 It is a social housing project designed in 1968 and finished 10 years later. The place itself has a web page http://alexandraandainsworth.org/. I started moving towards this place from the centre and took a tube to Swiss Cottage which is the nearest underground station. That flag doesn't fit here at all. And here it is, wow! The length of this baseline street called Rowley Way (continuation of possibly former Alexandra road) is about 340 meters and reaches Abbey road. I measured the distance using maps.google.com. In the above-mentioned pdf-file there was some mentioning of 1 kilometre long way which seems huge overestimation because even the full length from Abbey road to Loudoun road along this building is little over 500 meters only. I climbed up because it was basically still an open street and got more nice views of it. This is the Ainsworth way and the Ainsworth Estate. I had to put my camera on the edge of the Abbey road bridge because I couldn't see this view, the edge was too high. These towerblocks are not anything too nice but they are as they are.